The view of Labour members seems clear.Polling for a project on party membership - led by Prof Tim Bale of Queen Mary University - was published at the turn of the year. It suggested more than 70% of Labour's members backed a second referendum.And if it were held, nearly nine out of 10 would vote to remain in the EU.But this wasn't a poll of shadow cabinet members. Nine of Jeremy Corbyn's top team are very, very sceptical of - or opposed to - another referendum.And most of these are his political allies. Shadow foreign secretary Emily Thornberry was so concerned she wrote to shadow cabinet colleagues last night to argue that ditching a public vote on any deal - including one hammered out with the prime minister - would breach party policy and would require a vote of the whole shadow cabinet.At last night's special meeting of shadow ministers, I am told Ms Thornberry's possible leadership ambitions were aired. (She couldn't be there for family reasons). Key figures in Mr Corbyn's office were furious at her intervention. But the party's deputy leader Tom Watson - who doesn't always see eye to eye with the shadow foreign secretary - took to the airwaves to insist: "Our position is we want a confirmatory ballot. "It's very difficult for us to move off that because I don't think our party would forgive us if we signed off on Tory Brexit without that kind of concession. "Even more uncomfortably for the Labour leader, left-wing allies have written to him to push for a referendum commitment in talks with the prime minister.The eleven signatories include shadow ministers Clive Lewis and Rachael Maskell.They wrote: "We - your supporters - urge you to make a confirmatory public vote your bottom line in negotiations with Theresa May and to fight to bring this government down. 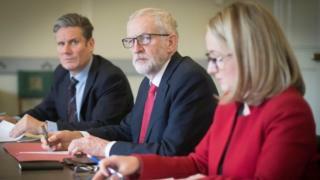 "Mr Corbyn has said he did raise the "option" of a public vote with Mrs May yesterday and shadow Brexit secretary Sir Keir Starmer said today that a "confirmatory vote" would be discussed at what are being billed as technical discussions between Labour and Conservative frontbenchers. Behind the scenes there is what to outsiders will look like a "dance on the head of a pin" argument going on as to what Labour's policy actually is on a public vote - but the interpretation could determine how hard, or otherwise, the referendum is pushed in talks. The motion agreed last autumn at Labour's conference says "should Parliament vote down a Tory Brexit deal, or the talks end in no deal" then there should be a general election.If that doesn't happen, then "Labour must support all options remaining on the table, including campaigning for a public vote".Supporters of a referendum say that Mrs May's "Tory Brexit deal" - as represented by two meaningful votes - has been voted down.So Labour should now be calling unequivocally for a "public vote" on any deal.Sceptics and opponents stress, on the other hand, that it should still be a last resort to prevent no deal, or another attempt to get Mrs May's unrevised deal over the line. So a group of 25 Labour MPs from Leave areas has written to Mr Corbyn urging him to "compromise" in talks with Mrs May.The group includes the shadow minister Gloria De Piero, and former shadow minister Melanie Onn, who resigned because she voted against the referendum option rather than abstain on an indicative vote.More familiar supporters of Mrs May's current deal - such as Caroline Flint and Sir Kevin Barron - have added their names too - as has Lisa Nandy, the former frontbencher who has so far held out against the prime minister's deal, but who could be persuaded if it were combined with a customs union.The signatories say: "Our policy… seeks a deal that protects jobs and rights at work. It does not require a confirmatory ballot on any deal that meets those conditions." But sources close to the Labour leader think the fuss over a referendum is over-blown, as government and opposition are unlikely to agree a joint motion on Brexit in any case.It's far more likely there will be a series of votes on a range of options - including a referendum - next week. Peter Kyle, who drafted a motion on the option of a referendum during the phase of indicative votes, is hopeful of success.His formulation garnered more votes - though not a majority - from MPs than any other option. But some close to the Labour leadership believe it will, once again, be rejected. That outcome would get both the prime minister and the opposition leader off a potentially painful political hook.But it doesn't bring a Brexit deal any closer.